Let’s do this again. For the third consecutive year, the Cleveland Cavaliers and the Golden State Warriors will face off in a seven game series with an NBA Championship on the line. Following Curry and Co.’s victory in 2015, LeBron and the Cavs stormed back from a 3–1 deficit to claim the 2016 edition in landmark fashion. When the Finals tip off on Thursday night in Oakland, it will mark the first time in NBA history that two teams have fought for a title in three straight years. Given that Cavs-Dubs Part III has been a foregone conclusion for a full calendar year, ratings are expected to be among the largest in league history. In 2015, I knew the Cavaliers had no shot. The Warriors entered the series scorching hot while the Cavs were hobbled by injuries and incomplete chemistry. I knew there was no chance, and I was correct. In 2016, I knew the Cavaliers would win. I don’t know how I knew, but I felt it. I’m not sure why everyone was surprised when LeBron and Co. pulled it off, because I spoiled the outcome on June 2. The Cavaliers returned to Cleveland with the city’s first major sports title in 52 years. I watched the game in Cleveland. It was a magical night. I cried. In 2017, I don’t know what to expect. The Best of 3 Finals — as it may someday be known — is tied, one trophy apiece, entering its third year. For the first time, I can honestly say I don’t know who will win. I’m going to try to make sense of it anyway. On the shore of Lake Erie, Cleveland took a simple approach to their 2017 playoff roster, which makes sense. They’re the defending champs, so there’s no reason to overhaul the lineup. When Golden State won in 2015, they brought the gang back and nearly repeated. Now that Cleveland won, they’re doing much of the same. The departures for the Cavaliers are minor. Matthew Delladova (46 minutes in the 2016 Finals), Mo Williams (29 minutes), Timofey Mozgov (25 minutes), and Jordan McRae (three minutes) are the only 2016 Cavaliers absent in this year’s series. In total, that’s just 103 minutes of lost contributions, which is (significantly) less time than Iman Shumpert alone spent on the floor last year. Conversely, the Cavs will replace those players with Kyle Korver, Deron Williams, and Derrick Williams. Out in The Bay, Golden State had an eventful offseason. They were surprise winners in the Kevin Durant sweepstakes, and paid the price by losing many of their role players. Departures for the Dubs include Harrison Barnes (222 minutes in the 2016 Finals), Leandro Barbosa (79 minutes), Festus Ezeli (61 minutes), Andrew Bogut (60 minutes), Anderson Varejao (41 mintues), Marreese Speights (33 minutes), and Brandon Rush (28 minutes). For the mathematicians at home, that’s 524 minutes of lost contributions. Filling in the gaps for the Warriors are Durant, Patrick McCaw, David West, JaVale McGee, Matt Barnes, Zaza Pachulia, and Damian Jones. Not only is that a half-roster of new faces, it’s also a collection of some of the most hatable players in the league. It is so easy to hate the Warriors this season. How can Golden State win? Listen, I know I said I have no idea what to expect in this series, and I meant that. However, I think it’s fair to say I have some idea. The Cavaliers are the underdog here. I know there has been some posturing by both teams in the media about who should be favored, but there’s a clear consensus in America. The Golden State Warriors sure seem like the better team, and this is their series to lose. Here’s an easy way the Warriors can win: Don’t lose a home game. Home court advantage is a beautiful thing. It’s feasible that Golden State goes 0–3 at The Q in this series and still lifts a trophy in two weeks. That’s the perk of being the better regular season team. The X’s and O’s answer is a bit more complicated, but not by much. The Warriors win if Steph Curry is Steph Curry. He won’t win MVP this season, but he’s still one of the most frustrating players in the league. In the Western Conference Finals, he shot 56% from the floor and 47% from deep. In just 34 minutes per game, he averaged 31.5 points. That’s lethal. If he’s scoring to that effect against Cleveland, the Cavaliers are in for a tough series. Compounding things for Tyronn Lue is the terrifying reality that Curry isn’t his team’s most potent offensive threat anymore. This year the Cavs will have to keep a bottle on Curry while also accounting for the Warriors’ newest addition. Kevin Durant will probably give the Cavaliers fits, and he’s an obvious Finals factor if the Warriors want to avenge last year’s loss. In the Western Conference Finals, Durant nearly matched Curry’s offensive potency, playing under 36 minutes per game while averaging 28 points on 60% shooting. It’s unlikely either Curry or Durant will match their WCF numbers that were unloaded on a hobbled Spurs team, but they’ll be champions if they can come close. Perhaps the biggest key to a Warriors title is chemistry. Intangibles are hard to account for, yet always play a bigger factor that anyone expects. Again, 50% of the Warriors lineup has changed since this time last year. While the Dubs have made this transition look seamless, keeping things together in a Finals series against their toughest competition is another story. They breezed through the Western Conference in just 12 games, and they better hope they had enough time to work out any kinks. Durant spent significant time on the bench with injuries this season, and even missed games in these playoffs. It’s very hard for newly-assembled teams to win a title in their first year, and so much of this Warriors team is new. If they can use their talent to close the gaps in chemistry, none of it will matter. They have LeBron James, and he’s chasing Michael Jordan’s legacy. “My motivation is this ghost I’m chasing. The ghost played in Chicago.” That is a direct quote from LeBron to Lee Jenkins last summer. How nuts is that? That’s one heck of a statement from a man who is already scrutinized more than any athlete in history. LeBron is on a mission this year, and if there’s anything we’ve learned about LeBron, it’s that the only thing more unstoppable than LeBron James is LeBron James on a warpath. I talked about intangibles when it comes to Golden State’s chemistry, and this is Cleveland’s intangible. The Cavaliers desperately want to repeat as champions and LeBron desperately wants to cement a legacy as the greatest athlete in American history. That’s an intangible force that is going to be hard for the Warriors to stop. I’ve seen this guy pull off a lot of amazing things in a basketball uniform, and frankly, beating this Golden State team probably wouldn’t be the most impressive. LeBron is a huge x-factor the Warriors will have to work around. As far as the rest of the team goes, it’s a little more nuanced. The Cavaliers need Kyrie Irving to be as good as he was last year, and I don’t just mean hitting game winners. In last year’s series, Irving played sidekick to the tune of 27 points per game on 47% shooting. While those numbers got the job done, Cleveland will probably need him to be more like he was in this year’s Eastern Conference Finals, where he unloaded 26 points per game on an astounding 62% from the field and 50% from deep. It was the best playoff series of his career, and he needs to carry that momentum into the Finals — as does Kevin Love. Love is playing the best basketball of his career, coming off a series in which he shot 49% from the field and 54% (!!!) from outside the arc while pulling in 62 total rebounds — nearly twice as many as Boston’s rebound leader. Love largely took a backseat in last year’s Finals. If he can bring this career-best mojo to the Warriors this year, the Cavaliers’ chances at winning greatly improve. If Cleveland wants another title, they must create a situation where three different players can blow a game open. LeBron and Kyrie did it last year. Love has to be number three. For Cleveland to go back-to-back, they’ll need big contributions from their bench. The second unit wasn’t nearly as impactful in the Eastern Conference Finals as they’ll need to be starting Thursday. Dellavedova’s departure will leave somewhat of a gap on the defensive end, but adding Deron Williams as a replacement should be a net positive. Delly was a minor factor in Cleveland’s final push last season, but Williams should provide more of a boost with his scoring pop off the bench and veteran presence in the locker room. While the Cavs largely shied away from using key rotation shooters like Channing Frye, Mo Williams, and James Jones in the 2016 Finals, the addition of Kyle Korver changes things in 2017. Korver was far from deadly in the ECF, but he’s one of the best shooters of his generation and can at least pose a threat in this series. Defensively, it’s still largely about stopping Curry. 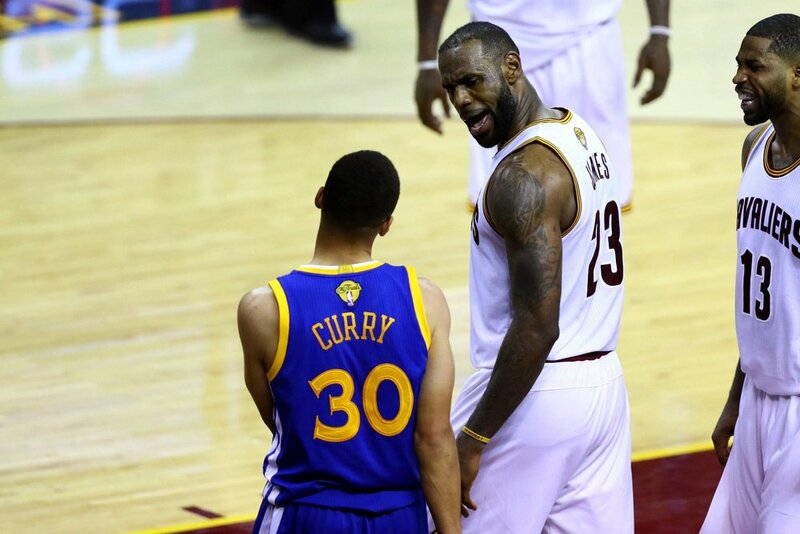 For two years now — but especially in 2016 — the Cavaliers gave Curry fits by simply beating the crap out of him. A lot is said about how fantastic Curry is despite his diminutive frame, but it finally cost him in last year’s series. In a league where the offensive trend is to switch everything, players like Steph Curry will always get worn out by aggressive teams who are willing to put in the effort to grind them down. Curry was the league’s first unanimous MVP and then shot just 40% from the field in the Finals — largely because the Cavs wore him out on the defensive side with and endless litany of switches. On nearly every Cavaliers offensive possession, Curry was either running around a screen or getting brick-walled by Kevin Love or Tristan Thompson. It may sound minor, but that’s a lot of wear and tear on a shooter over a seven-game series. The Cavs need to bring the same mentality this year. I’m not sure if it’s possible to stop Kevin Durant, but the Cavaliers will try — or at least hope Durant’s dual yips in pressure games and against LeBron James will counteract his immense talent. While individual defensive matchups will be rendered less important by constant switching from Golden State, I suspect LeBron will spend the majority of his defensive time on KD. This will be a crucial aspect of the series, because much like the Curry situation, LeBron can’t afford to burn tons of energy on the defensive end. Often overlooked but hugely important is Draymond Green. So much of what Green brings to the table is from a distribution standpoint. While he’s a scoring threat, his biggest asset to Golden State is his ability to make the offense click. If the Warriors offense is a wheel, Green is the hub. He can catch the ball anywhere on the floor and manage to find the open man. Tristan Thompson will likely be the guy tasked with stopping him, and passing lanes will end up being more important to defend than shooting strokes. In the end, it’s all about matchups. There probably isn’t a team in the league that can say they match up well against this loaded Golden State squad, but the Cavaliers come the closest. Like last year, the Cavaliers will need to win with defense. Cleveland’s Big Three will get their points. If the bench can play to its offensive potential and the entire lineup can assemble another defensive masterpiece like the end of the 2016 series, it will be enough to win a title — perhaps even in fewer than seven games. It’s a tall task, but the Cavs are the only team built for it. I think Golden State’s lack of experience with this roster will hurt them. They’ve made it look easy through the playoffs thus far, but their toughest competition was a severely injured Spurs team. Nobody seems to be talking about this, but the Warriors starting lineup has spent just ten games together in the playoffs. In today’s NBA, the playoffs are all that truly matters, and ten games of “mattering” is nothing. Teams take time to come together, and that’s a very short sample size that Golden State brings to the table against their toughest opponent. Those 524 minutes of lost contributions from last year’s series are a lot. 524 minutes is more than five times what the Cavaliers lost from last year. 524 minutes is more than what Steph Curry and Klay Thompson played in last year’s Finals combined. That kind of personnel turnover shouldn’t be overlooked. I thought the Warriors had a nearly perfect team last year. Everything fit together (virtually) flawlessly. They didn’t lose because of a lack of personnel. It sounds absurd to argue that a team could be worse by adding Kevin Durant while also maintaining the Big Three, but the Warriors may have been too reactionary when they completely jacked up the best regular season team in league history. If your BMW gets a flat tire, you don’t saw off the back end and stick a jet engine in the trunk. That’s what the Warriors have done by adding Durant. In theory, the Warriors’ BMW can go much faster now. However, there’s also a chance things fall apart when the pressure reaches its greatest. It was a gamble and we’re going to see if it pays off. Oh, also, they’re missing a head coach. Steve Kerr took a leave of absence due to illness way back in the opening round of the playoffs and has yet to set a timeline for a return. If he misses the entire Finals, that certainly doesn’t help the Warriors at all. I’m a Mike Brown fan, but he doesn’t have Kerr’s track record, and he hasn’t had the preparation for this role. How much Golden State’s chemistry (or lack thereof) hurts them will be the determining factor in these Finals. If things run relatively smoothly with only minor kinks, the Warriors will head home with a trophy after five games. If things start to break — much like they did in the final three games of the 2016 Finals — there’s a chance Cleveland is the one celebrating in five. However, things are rarely that black and white, and the chemistry effect will likely be somewhere in the middle of those polar opposites. I hate to make official, public predictions, but I’m going to do it. You’ve read my drivel for this long. The least I can do is put myself on the line. My heart says Cleveland in seven games but my brain says Golden State in six. As much as LeBron wants this one, the Warriors were absolutely humiliated last season and responded by adding the second best player on the planet. Those simple facts, along with home court advantage, feel like an insurmountable task. But again — like I said at the beginning of this post — I truly don’t know what to expect. It’s all up in the air and I’ll be as surprised as anyone at the outcome. Let’s win another one. Go Cavs. Go Cleveland.